I've seen what some of you have had to say about some of Stratford's other efforts, so I guess I shouldn't have been so surprised. It's one thing to change the words for topicality, but… They rewrote the 2nd and 3rd verses of "When Britain Really Ruled the Waves," the middle of the Nightmare Song, "O Foolish Fay" in its entirety, and hunks and pieces of almost everything else. Many of the lyric changes didn't seem to serve any purpose, either — change for its own sake, it seemed. They also "trimmed" the text here and there. Carrière also took great liberties with tempos, and inserted entire chunks of music for production numbers. They were well executed, but I didn't feel that they matched the rest of the show (a minstrel number? a tap number?!). Tolloler cheated on just about all the highest notes and had a character singing voice, not the true tenor I would have expected. Under the circumstances, I'm not disappointed that "Blue Blood" was cut. In many cases, it looked like the singers were lip-synching — not sure whether that was sloppy sound engineering, or if they recorded the singing separately. There were a lot of things I didn't care for about the characterizations, and more than a whiff of pork pie. For example, I think the magic tricks were overdone. The whole "company putting on Iolanthe" set-up, played over the overture, I could have done without, although I'd love to know how they engineered the box that opened out to become the central portion of the fairyland set. The overall acting I felt was over the top — exaggerated as if to make sure the audience understood this was a comedy. Fleta's lines are given to a character called Babs (Karen Wood). In other words, in this show-within-a-show concept, Babs is the actress who plays Fleta. Babs also has some pre-curtain business with the crew, and a post-curtain-call bit as well. I was very impressed with the fact that nearly all the singers were dancers as well. I didn't like the 1 or 2 'awkward' fairies, and in fact I felt that most of the dance numbers didn't particularly suit the production. More like someone decided, "OK, we need a dance number here. I think we'll have 'em do…" It was well executed; I just wish I knew how it related to the storyline. Admittedly, having just done Iolanthe (with the Washington Savoyards) less than 2 months ago, that production is still very much in my mind. I think that some of my discomfort is a matter of "but our blocking has the fairies here, not there" and "but that's not the tempo the MD set." The Stratford Festival production of Iolanthe is a delight from start to finish. Traditionalists might object to some of the liberties taken with the dialogue but this certainly makes the live audience all the more appreciative. The setting is an old Victorian Theatre ("the second largest Opera House outside Toronto") as is explained at the beginning of the production, probably at the turn of the century. Various cast and back stage crew mix and mingle during the Overture and the set is assembled on the stage in front of our eyes. Vocally, I have yet to see a production to match this one. While most of the cast are far more than "seventeen" or "five and twenty," this slight can be overlooked at a performance which deliberately "hams" its way through the show. Maureen Forrester stands out as the Fairy Queen, and Eric Donkin as the Lord Chancellor is obviously enjoying himself. The one disappointment is Paul Massel as Strephon whose accent really tends to grate after a while. The orchestra play with polish but the added harp is a bit over used. The choreography is excellent, and even through the cast burst into Christy Minstrel, Can Can and tap routines, this got me laughing, so I felt that it worked. Others may disagree. And so of course we won! 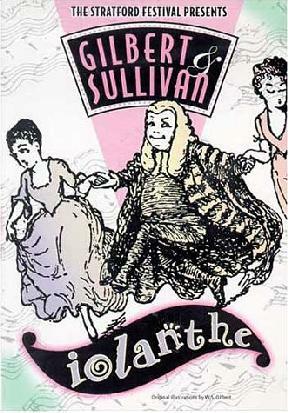 The DVD version includes a complete list of text alterations, with both the original and revised lyrics; a glossary of terms that might be unfamiliar to today's audienc; some historic photographs of various cast members from the original production onwards; and biographies of Gilbert and Sullivan. There is also a fifteen minute video on Stratford and the festival. Mel Moratti obtained a three-DVD package of the Stratford Pirates, Iolanthe, and Mikado. I have seen them sold separately on some websites, such as Amazon.com. Mel says that the advertising states that the DVDs have "CD quality sound," but he says that the sound quality is awful. Oddly, enough, for Iolanthe, Act I is in mono, and Act II is in stereo. The others are in mono throughout. Mel's summary: "In their current form I would feel uncomfortable recommending them to anyone." The Iolanthe DVD also has a visible "skip" in the middle of the finale of Act I, where Strephon sings, "Can I inactive see my fortunes fade?" It is caused by the jumping between layers on the DVD. All DVDs that exceed a certain length have this jump, but a more conscientious editor would have put it in a less conspicuous place (e.g., between the acts). 1988 Home Vision NTSC VHS IOL01 Protective jacket captioned "THE COMPLEAT OPERAGOER #72"
1999 Acorn Media DVD AMP3456 Three-disc set of the Stratford Pirates, Iolanthe, and Mikado. Copyright ©1995–2010. All Rights Reserved.